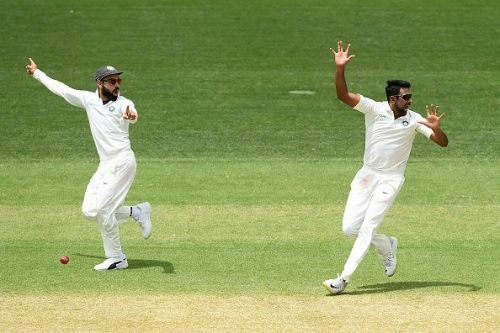 The second day of first Test match played at Adelaide Oval saw the Indian bowlers making life extremely tough for the Australian batsmen. India’s last wicket fell off the first ball of the day. However, the visitors bounced back strongly as Ishant Sharma, Jasprit Bumrah, Ravichandran Ashwin kept striking at regular intervals. Starting the second day at 250 for 9, Mohammed Shami was dismissed off the very first ball of day by Josh Hazlewood. India got off to the perfect start as Ishant Sharma castled Aaron Finch in the first over itself. Debutant Marcus Harris and Usman Khawaja steadied the Australian innings by putting on 45 runs for the second wicket. Ashwin dismissed Harris for 26 and Australia went into lunch at 57 for 2. India struck again in the very first over after lunch when Ashwin removed Shaun Marsh for 2 runs. It was a splendid bowling effort by their bowlers to restrict the Australian batting line-up. The off-spinner struck again by dismissing Khawaja for 28 runs. The hosts found themselves under pressure at 87 for 4. Travis Head and Peter Handscomb combined to help them go into tea at 117 for 4. After the tea break, Bumrah got the wicket of Peter Handscomb for 34 runs. Head and Handscomb had added 33 runs for the fifth wicket. Ishant then dismissed Australian captain Tim Paine for just 5 runs. Head and Pat Cummins entertained the crowd with some attacking stroke play. The left-hander reached his half-century off 103 balls. As soon as India took the second new ball, Bumrah landed a vital blow by dismissing Cummins for 10. At the end of the second day, Australia made 191 for 7. They are still trailing India by 59 runs. Head remains unbeaten at the crease on 61 along with new batsman Mitchell Starc. Brief Scores: Australia - 191/7 in 88 overs (Travis Head 61*, Peter Handscomb 34, Ravichandran Ashwin 3/50, Ishant Sharma 2/31, Jasprit Bumrah 2/34) trail India - 250 all out in 88 overs (Cheteshwar Pujara 123, Rohit Sharma 37, Josh Hazlewood 3/52, Pat Cummins 2/49) by 59 runs.